My attorney asked more patience from me when giving BoatUS three business days to respond to his letter. Patience is not a virtue I was born with, and frankly I’m not sure how many people naturally have it. It’s a theory of mine that most people just mask their impatience better than others. Three business days meant that the actual number of days that passed was five, as a weekend butted itself into the middle. Attorneys, such as Isaac, are all about following procedure, establishing written records and accounts of what happened when, should the issue ever need to be taken further, say to court. I understood his reasons, followed them, and continued to live in my boat, such as it was. As I alluded to in the previous post, fellow bloggers took my issue to heart and spread it. If you had Googled “BoatUS reputation” that week (and you still can), the Middle Bay Sailing blog comes up on the first page, a blog which discussed my situation and linked back to my own blog. Other bloggers also headlined my story, but Middle Bay Sailing, by how the post was worded, got attention from BoatUS personally. I had told Isaac, my attorney, that I was blogging about the situation and sticking to the facts and my feelings. I’d refrained from speculation and hadn’t made threats. What had happened and how I felt were all relevant to my tale, and I felt others should know about what was going on, should something like this happen to them. When week three rolled around, so did the deadline for BoatUS to respond to my attorney. And they did. But it wasn’t my adjuster who responded. No, no, the vice president of the claims department responded. The VP of claims also contacted Rick of Middle Bay Sailing telling him (but addressing me) that BoatUS was working on my claim as quickly as possible. Isaac was impressed. The power of the pen is a mighty one, especially when it takes a few clicks to spread the story to a plethora of other people. I was impressed too, and if I could afford it, I’d shower all of you with an endless supply of chocolates and espresso. To aid in the negotiation process, and knowing that BoatUS was reading what I was writing, Isaac advised me to make a quick, short post about being in contact with BoatUS. BoatUS decided, per the surveyor’s report, that my Islander was a total loss. 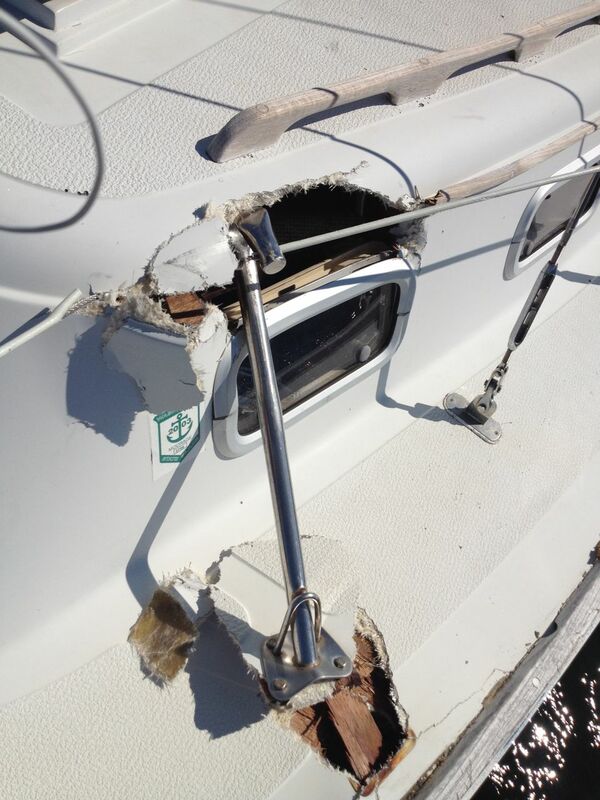 Repairing the damage to the boat cost more than what BoatUS deemed its value. BoatUS’s first offer of a settlement was to allow me to keep the boat and send me a check for the boat’s value. At the time I had desperately hoped to repair the boat, and though I appreciated that I got to keep my own boat (sarcasm), the dollar value of its worth would not be sufficient to make repairs and allow me to stay in hotel while repairs were being made. Isaac then sent a counter offer, pointing out that the report the surveyor had submitted did not explain how the numerical value of my boat was reached, and we sent along a comparable of my Islander’s sister ship for sale in Ladysmith, BC. My boat had newer features and a diesel engine, so we contended that my boat was worth what the sister ship was worth, if not more. He also wrote that if we were taking this issue to court, we’d argue my boat was not a total loss, based on the comparable boat, but for the sake of litigation purposes, we’d accept the total loss in exchange for a better settlement. We asked for a higher amount. Sorry, I’m not going to give numbers. BoatUS counter-offered, raising their initial number a little. Isaac and I discussed it, and we decided to counter again. But BoatUS was firm on their offer, they wouldn’t go a dime over. I wanted the issue over and done with (and I still do, by the way). Isaac advised I accept the offer and thus be done with the settlement and BoatUS. I did. Allow me a brief commentary on business. A business, if it is to be a business, must do two things, and the two things are interchangeable: make a profit, do their job. In order to make a profit, they must do their job, and doing their job makes a profit. Simple. Exceptional businesses do both well: do a great job and make a lot of profit (I’d say to have one you must have the other, but that’s just me). Insurance companies make their money by playing a number lottery and taking risks. In order for them to make a profit, they must have more customers paying and not withdrawing. It’s the nature of their business, and I get that. The most profitable insurance company is one whose members are responsible and lucky, in that they never cause or are involved in accidents. The more of these people they have, the more money insurance companies make. However, based on my simple formula of what it takes to be a business, a business must also do its job, and for an insurance company, that means insuring its customers: paying for the accident. That makes insurance companies a different kind of business; in order for them to make a greater profit, they have to do their job less. Did BoatUS do a good job? Reaching a settlement and receiving a check in three weeks is fast, I’ve never denied that. But what made it fast was my quickness to write about it and my attorney’s involvement. Throughout the process I had friends and internet-strangers/cheerleaders encouraging me to not back down. There was never a danger of that happening. BoatUS did their job of covering their insured and paying for the accident, but that’s as far as they went. They covered the adjusted value of the boat, and let me keep my own vessel, presumably to continue living on it, have it repaired, or salvage it, whatever I chose to do. Would they have done the same if they’d only dealt with me or my insurance adjuster and not my attorney? Would they have made the same offer had I not taken to the internet and made myself one loud and obnoxious squeaky wheel? I’m not sure, but I doubt it. Those things were never covered by BoatUS, nor do I think they’re legally obliged to cover in the case of a total loss. If the boat had been saved and then repaired, then yes, BoatUS would probably be responsible for my lodging while the boat was up on blocks. But nothing else. Had I wanted to spend the time, stress, and money on filing a lawsuit to cover the above losses that Mr. Rammer incurred by his striking and totaling of my vessel, in theory I may have recovered those losses, but at what cost? Would it be worth all of that? Would dragging out this whole ordeal have been in anyone’s best interest? It is impossible for most people to separate their emotions from the destruction of their property, especially their home. I kept as level a head as I could by staying busy, by moving the process forward. I was not content to sit and wait. Since my total loss was not a car, but someplace I spend every day aboard, I couldn’t afford to wait for the insurance company to twiddle their thumbs and wait for reports and run calculations. I had to make things happen, and happen they did. Be pushy. Don’t wait to be called, call first. After your first initial call, then insist that all communication be done in writing. Keep a written record of everything: things said, when, by whom. Keep all emails. Be as detailed as possible. Choose a boatyard to put together an estimate for you, do not let the insurance company tell you what your repairs will cost or what your boat is worth. If you chose to let your own insurance company handle it, that’s of course your choice, and it has advantages, mainly that you won’t have to deal with the other insurance company personally. However, I’m not sure how urgent anyone other than you, the person who’s property was hit, would act. Having had a car totaled (by a teenager with passengers in her car and thus not paying attention to what was happening in front of her), I know that even dealing with your own insurance company to get things resolved can be just as much of a nightmare. If you feel like the insurance company is dragging their feet, hire an attorney, and hire one the moment you feel you should. Do not wait. I recommend Isaac. Do your own research by finding comparable boats in your area. Insurance companies make their money by paying less, so it’s up to you to find real prices on real boats that compare to yours IN YOUR AREA! Respect the power of the pen. It’s impressive, especially nowadays. I knew exactly what I was doing when I started thumping the internet with my tale of destruction, and had I felt it necessary, would have contacted bigger sailing sites and blogs, to get my story spread faster. The internet is full of stories of how people had something valuable stolen and hopped on Twitter, Facebook and YouTube to amass an army of people who wanted to help. It works. Thus ends my story of how I dealt with BoatUS. Once I had the check and deposited the money, the story was over. BoatUS is done with their settlement. Of course my boat ramming situation is far from over. If you have a question, something that wasn’t covered in parts one, two, or three, please ask it in the comment section and I’ll try answering as best I can. In addition to Isaac Anderson, I also recommend the great people of CSR Marine. They do fantastic work, and had I the time and money to have my Islander repaired, I would’ve taken her to CSR. Great, patient, thorough folks over there, and good to work with. The sailors and salts both on the Sailnet and Sailing Anarchy forums were also fantastic, offering advice, jokes, and pearls of wisdom.